I'm a sucker for Retro Chic. I can't help it, I love the designs and patterns and just... well, I just love it all. My mother sometimes wondered if I wasn't born in the wrong generation, because my tastes have always wandered towards the styles and fashions of old rather than new. That's probably why I'm so intrigued by today's shop. I absolutely hate those "barbecue" style aprons they sell in today's market. I just don't like that style and it's just yuck to me. Today's shop specializes in aprons, but not that newer style you see every grill slinger from here to hell and back wearing. Instead, the shop specializes in Retro Chic styles of bygone era and I LOVE them for it! Do you have any idea how long I've been searching for someone selling these style of aprons? Probably not, but trust me, it's been a very long and arduous search. Sugar Pie Chic is filled with these beautiful pieces. And, while design is important, quality also matters to the owner of this wonderful shop. All of her aprons are made from 100% cotton designer fabric and are made to last with double-stitching on stress points and quality materials that make these aprons not only pretty but durable and made for work. TO VISIT SUGAR PIE CHIC'S SHOP ON ETSY, YOU CAN CLICK THE PICTURE ABOVE OR, IF YOU'D RATHER, CLICK RIGHT HERE! OH, I think just found the perfect gift for my niece for xmas next year...too bad her birthday was last month. Oh my gosh, reminds me of the 50's. 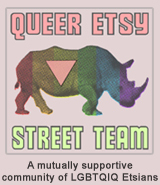 Love this blog and this Etsy Seller, thank you! that's sooo cute! So etsyish, and chic. 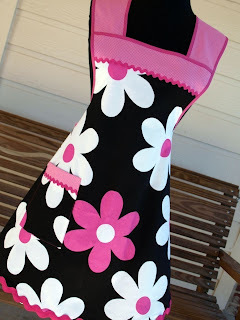 I can be inspired baking cutsie cupcakes and sweets with this apron... Dropping by from SITS! Very cute! I should get myself a cute apron, because I definitely make messes in the kitchen.